Welcome! Relay For Life is a fun and moving overnight experience that raises vital funds for the Cancer Council’s research, prevention, information and support services. 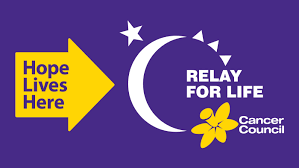 Relay is a chance for the WHOLE community to recognise and celebrate local cancer survivors, patients and their carers, to honour and remember loved ones lost to cancer and to raise money to help save more lives. Join the thousands of Australians 1 Jan 2018 who take part in Cancer Council’s Relay For Life each year in the fight against cancer: start or join a team in the Launceston 2018 Relay today!